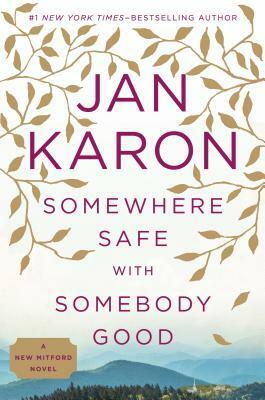 What an absolute pleasure it was to read Jan Karon’s newest book Somewhere Safe with Somebody Good! With this new book, readers can continue to follow the lives Father Tim Kavanaugh and his wife Cynthia and a wonderful mix of characters in the lovely fictional town of Mitford, North Carolina. When reading this book felt like I was going home and seeing the people whom I love, who are a little quirky. But isn’t that part of what makes them so loveable? Jan Karon’s writing is exceptional. Characters come to life and are well developed over time. The story is simple yet rich and complex in the ordinary adventures called life. A composition of vignettes told through the perspective of everyone’s favorite Episcopal priest, Father Tim who is now retired. The cast of characters is wide ranging and yet a beautiful blend of people I would like to know. Jan Karon doesn’t strive to be edgy. Instead she creates characters that are real and likable even with their imperfections. My favorite thing about this book is how the characters Christian faith is interwoven throughout the story. I loved reading Father Tim and Cynthia’s prayers. I loved the compassion and brokenness that came through when Father Tim wept as he told of the failure and sin of fellow clergyman. I learned that I want to have that kind of love and compassion that desires repentance and to restore a fellow sinner. I so appreciate the sharing of the Gospel message in a simple way, but one so fitting the storyline. I can always tell a book is really good when I’m thinking about the characters after I’ve set the book down and can’t wait to get back to them. The only downside to this book is that it ends, but hopefully the story will continue in another book by gifted writer Jan Karon. Even though this is the latest book in the Mitford series, it makes a good stand alone book. I do caution you though, you will likely want to go back and read the earlier books when you fall in love with the characters. Jan Karon is one of the best writers of her generation and I am grateful to have read her latest book Somewhere Safe with Somebody Good. I would like to thank Putnam publishers for providing me with a copy of Somewhere Safe with Somebody Good to read in exchange for an honest review. I was under no obligation to give a favorable review.